Geologist Dacey Livingstone is called in to investigate a mysterious sinkhole that has opened up and swallowed an entire house in Oklahoma. Upon descending into its depths, the only evidence of debris is the roof. Why is there nothing else? It's as if it has disappeared into thin air. Elsewhere, other strange incidents are occurring; a supertanker apparently breaks up and sinks to the bottom of a boiling ocean; a severed arm plunges to the ground during a football game. These strange phenomena are gaining impetus, yet no one can offer an explanation. That is until genius astrophysicist Gerald Meier comes up with the crazy notion of wormholes. He and Dacey join forces in what becomes a race against time to save the world from impending disaster. Wow, what a fantastic adventure! This is just the type of book I love. I'm not sure how plausible the science is in real life but it really didn't matter because the author made it all come together in a way in which it seemed real in the book. When an author can do that with competent professionalism, you know you're on to a winner. Yes, there were clichés - the handsomely charismatic young scientist, the wealthy-beyond-dreams estranged father, the Armageddon disaster scenario - but heck, it was an exhilarating, rip-roaring ride! The eclectic mix of characters made for interesting reading, especially one in particular during the closing chapters. I shall say no more about that though because I'm sworn to spoiler secrecy. 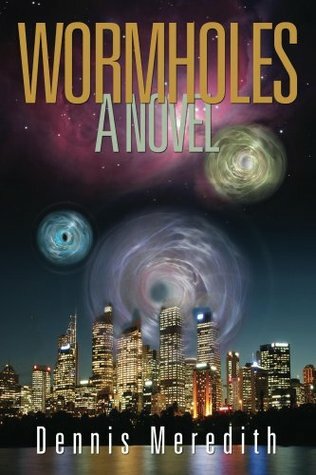 If you love science, space and adventure you can't go far wrong with Wormholes. My thanks to Dennis and Joanne Meredith for providing a copy of this book. Could these catastrophes possibly be related? Intrepid geologist Dacey Livingstone is nearly killed by her first attempt to plumb the mystery—a perilous descent into a house-swallowing sinkhole. Still determined, she joins with eccentric physicist Gerald Meier in a quest that takes them from the ocean's depths to interstellar space. What are these exotic "wormholes" that threaten Earth? Can their secrets be discovered, their power even harnessed? Or will they spawn a celestial monster that will annihilate the planet?